The NASA/ESA Hubble Space Telescope has discovered the brightest quasar ever seen in the early Universe. After 20 years of searching, astronomers have identified the ancient quasar with the help of strong gravitational lensing. This unique object provides an insight into the birth of galaxies when the Universe was less than a billion years old. 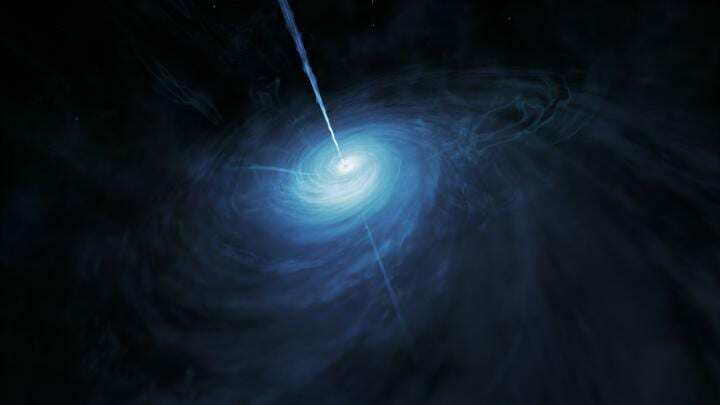 Astronomers using data from the NASA/ESA Hubble Space Telescope have discovered the brightest quasar ever seen in the early Universe — the light received from the object started its journey when the Universe was only about a billion years old. Quasars are the extremely bright nuclei of active galaxies. The powerful glow of a quasar is created by a supermassive black hole which is surrounded by an accretion disc. Gas falling toward the black hole releases incredible amounts of energy, which can be observed over all wavelengths. Despite its brightness Hubble was able to spot it only because its appearance was strongly affected by strong gravitational lensing. A dim galaxy is located right between the quasar and Earth, bending the light from the quasar and making it appear three times as large and 50 times as bright as it would be without the effect of gravitational lensing. Even still, the lens and the lensed quasar are extremely compact and unresolved in images from optical ground-based telescopes. Only Hubble’s sharp vision allowed it to resolve the system. The data show not only that the supermassive black hole is accreting matter at an extremely high rate but also that the quasar may be producing up to 10 000 stars per year . “Its properties and its distance make it a prime candidate to investigate the evolution of distant quasars and the role supermassive black holes in their centres had on star formation,” explains co-author Fabian Walter (Max Planck Institute for Astronomy, Germany), illustrating why this discovery is so important. Quasars similar to J043947.08+163415.7 existed during the period of reionisation of the young Universe, when radiation from young galaxies and quasars reheated the obscuring hydrogen that had cooled off just 400 000 years after the Big Bang; the Universe reverted from being neutral to once again being an ionised plasma. However, it is still not known for certain which objects provided the reionising photons. Energetic objects such as this newly discovered quasar could help to solve this mystery. For that reason the team is gathering as much data on J043947.08+163415.7 as possible. Currently they are analysing a detailed 20-hour spectrum from the European Southern Observatory’s Very Large Telescope, which will allow them to identify the chemical composition and temperatures of intergalactic gas in the early Universe. The team is also using the Atacama Large Millimeter/submillimeter Array, and hopes to also observe the quasar with the upcoming NASA/ESA/CSA James Webb Space Telescope. With these telescopes they will be able to look in the vicinity of the supermassive black hole and directly measure the influence of its gravity on the surrounding gas and star formation. J043947.08+163415.7 was selected on the basis of its colour by combining photometric data from the United Kingdom Infra-Red Telescope Hemisphere Survey, the Panoramic Survey Telescope and Rapid Response System (Pan-STARRS1) at optical wavelengths, and the Wide-field Infrared Survey Explorer archive in the mid-infrared. Follow-up spectroscopic observations were conducted with the Multi-Mirror Telescope, the Gemini Observatory and the Keck Observatory. The brightness of the quasar includes the magnification factor of 50. Without the magnification through gravitational lensing the luminosity of the quasar is equivalent to about 11 trillion Suns. Because of the boosting effect of gravitational lensing, the actual rate of star formation could be much lower. By comparison, the Milky Way produces approximately one new star every year. The results were presented at the meeting of the 223rd meeting of the American Astronomical Society and will be published in the Astrophysical Journal Letters. The international team of astronomers in this study consists of Xiaohui Fan (University of Arizona, USA), Feige Wang (University of California, USA), Jinyi Yang (University of Arizona, USA), Charles R. Keeton (Rutgers University, USA), Minghao Yue (University of Arizona, USA), Ann Zabludoff (University of Arizona, USA), Fuyan Bian (ESO, Chile), Marco Bonaglia (Arcetri Observatory, Italy), Iskren Y. Georgiev (Max Planck Institute for Astronomy, Germany), Joseph F. Hennawi (University of California, USA), Jiangtao Li (University of Michigan, USA), Jiangtao Li (University of Michigan, USA), Ian D. McGreer (University of Arizona, USA), Rohan Naidu (Center for Astrophysics, USA), Fabio Pacucci (Yale University, USA), Sebastian Rabien (Max Planck Institute for Extraterrestrial Physics, Germany), David Thompson (Large Binocular Telescope Observatory), Bram Venemans (Max Planck Institute for Astronomy, Germany), Fabian Walter (Max Planck Institute for Astronomy, Germany), Ran Wang (Peking University, China), Xue-Bing Wu (Peking University, China). Image credit: NASA, ESA, X. Fan et al.